Duke Memorial encourages children to live out their baptismal vows by entering into ministry in the church. We are delighted, encouraged, and refreshed by the presence of children in worship. 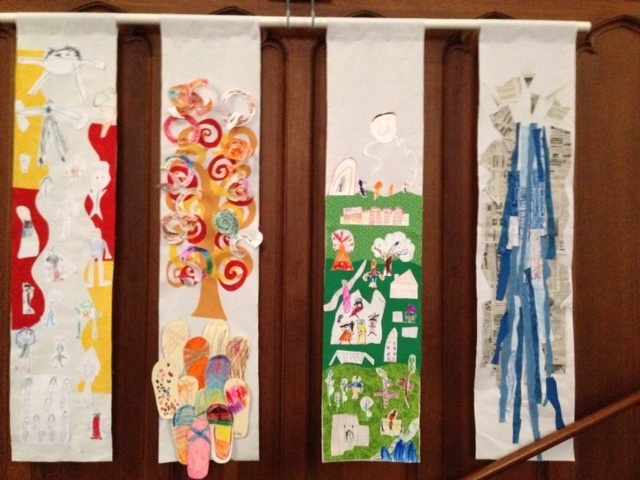 Children participate in worship as ministers of the church in a variety of ways. Acolytes Fourth and fifth graders are invited to carry the light of Christ into the congregation. Training is available throughout the year. Contact Minister Melissa for more information. Lectors The second Sunday of each month the Word is proclaimed from the pulpit by one of our children. Pew Projects Each week we offer children a Pew Project, a hands-on mini-sermon that helps them engage the Scripture through their creativity. These projects are often incorporated into worship. Living Gospel Throughout the year children present the Gospel reading to the congregation by bringing it to life with their words and actions. Worship Bags Younger children can engage worship by writing prayers, drawing Scripture scenes, coloring stained glass, and reading their children's Bibles. Each child who regularly attends has their own personalized bag. Bags are also available to our visitors. You will find them in the hallway behind the sanctuary.